Activated Carbon Filter Unit – The damaging effects of atmospheric pollutants have long been acknowledged as a cause for environmental concern. EMCEL has researched and developed the use of activated carbon filters capable of reducing these atmospheric pollutants to acceptable levels. The Sonoxcarb filter unit has been designed and manufactured as a result of these findings and the unit has demonstrated high efficiency performance in areas such as museums, art galleries, libraries and archive stores where control of atmospheric pollutant gases is critical for the prevention of corrosive damage to priceless artefacts. The filter contains varying number of cells in V formation. All cells are manufactured with the unique honeycomb internal structure and filled with high quality impregnated grades for specific contaminants. 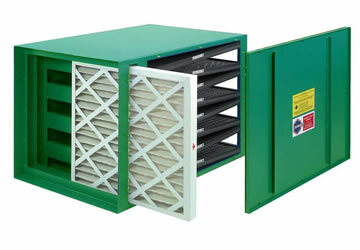 Standard airflow capacities from 0.25 to 1.0 m³/sec, larger airflows can be accommodated by custom built carbon filter units designed and produced by EMCEL.